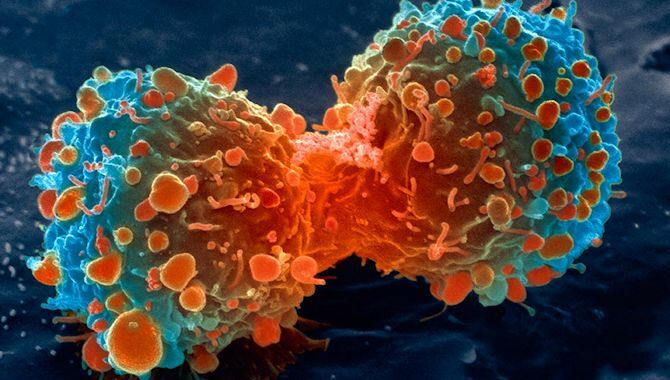 There is currently a notion circulating that cancer is primarily due to “random mutations”. I have come across this statement twice, first in a Cell Biology text (I won’t name it out of deference to the authors), and in a January 2015 issue of Time magazine. My gut reaction to this hypothesis is that it is either patently false, or at best only a half-truth. I indicated as much to an undergraduate class while teaching Cell Biology in the following way. I quoted the text on the lecture slide and then, in capital letters, bolded, inscribed beneath it: FALSE. Evidence from more than half of the last century flies in the face of this theory, and I will not allow current advances in genetic analysis to defend it. To attribute all cases of cancer to random mutation cognitively diminishes several causes of cancer that have been definitively proven. A list is not that difficult to come up with --- ionizing radiation, ultraviolet light, ingestion of radioisotopes, various DNA viruses, the retroviruses, and a long list of chemicals that are frank carcinogens, including benzanthracene, benzo[a]pyrene, and dioxin, a contaminant of the defoliant “Agent Orange” that was widely used during the Vietnam War. Perception is not always reality, and while these are in fact the cause of what may be called “random” mutations, the ability of these agents to cause transformation of normal cells to a proliferative phenotype devoid of growth control cannot be called a random event. While the length of this article does not permit an examination of the mechanism of each of these agents, some brief details are quite illustrative. In the era of atmospheric nuclear weapons testing, an epidemic of thyroid cancer in young teenagers was traced to radioactive iodine isotopes that settled out on the grass of dairy farms. Drinking the milk containing them resulted in concentration of the isotopes in the children’s thyroid glands (Barry Commoner, “Science and Survival”, Viking Compass, 1967). Had this epidemic been ascribed to random chance, the nuclear test ban might never have been arrived at or maintained. This phenomenon was repeated following the meltdown at the Chernobyl nuclear reactor, hardly a random occurrence given the geographical distribution. The literature on multicyclic aromatic compounds goes back as far as 1949, when Setala noted a synergistic effect of benzanthracene on the microtubule disruptor colchicine during the development of skin cancer in mice. To this day, benzanthracene and benzo(a)pyrene are standard compounds used to induce cancers in laboratory animals. Unfortunately, they are also described as “ubiquitous” carcinogens, found in diesel exhaust particulates and asphalt, with small amounts even generated during grilling of food. Perhaps it is easier to accept the continued introduction of these compounds into the environment from crude oil derived products if any dire consequences are attributed to “random” causes. During my undergraduate work at the University of Texas at Austin, I had the great privilege to take a course under Dr. David T. Gibson, a graduate of Leeds. He determined how bacteria break down benzene as a sole carbon source, using a strain of Pseudomonas putida. There is a difference in the metabolism of aromatic compounds in bacteria and eukaryotic cells. In both cases, the first intermediate is an epoxide, basically a triangular oxygen bridge between two adjacent carbon atoms. Hydrolysis of this strained intermediate produces a cis-dihydrodiol in bacteria, but a trans-dihydrodiol in animals. The diols can then be cleaved by further oxidation, thus cracking open the ring. There’s a problem with some compounds, in that the epoxide is not easily hydrolyzed to the diol, but remains highly reactive, and will easily form bonds to polynucleic acids such as DNA and RNA. This is the case with benzo[a]pyrene, in which the formation of a diol at the 7,8 position serves to stabilize an epoxide linkage at carbons 9 and 10. Mutations in genetic material due to binding of such reactive intermediates can result from steric hindrance during replication or outright strand breakage. However, highly specific mechanisms for tumor induction have recently been revealed, including an aromatic (aryl) hydrocarbon receptor, involvement of P450 cytochromes, and even upregulation of microRNAs that favor cell transformation. Thus, while some generated mutations may be random, there is nothing random in either the ability of these aromatic hydrocarbons to cause them or in the complexity of the mechanisms used. Dr. Gibson was concerned not only with the metabolism of aromatic compounds, but especially those bearing a halogen such as chlorine, fluorine, or bromine, like dioxin (2,3, 7,8-tetrachlorodibenzo-p-dioxin), one of the most carcinogenic substances known. He also introduced us to the plethora of multicyclic compounds present in crude oil, especially those in the heavy “asphaltene” fraction that are resistant to degradation and may persist for decades after a crude oil spill. The spectacle of FDA inspectors doing a “sniff test” for hydrocarbons shortly after the BP Gulf oil spill would be ridiculous if it were not so alarming. To allow consumption of any organisms drawn from the Gulf fishery so soon after the spill without full analysis, including GC/MS of any organic compounds was, in my mind, unconscionable. I am not an organic chemist or a toxicologist --- my dissertation studied the modulation of the immune system by intracellular pathogens. I came by it during a career in the diagnostic and pharmaceutical industries. But I never forgot what David Gibson taught me so many years ago --- that the ability of some agents to cause mutations is not a random phenomenon. The assault of carcinogenic viruses and chemical mutagens in our environment will continue. But I for one will not allow them to remain unnamed and anonymous under a cloak of randomness.